A mechanical device with the capability to send power to a front driving axle as well as a rear driving axle. 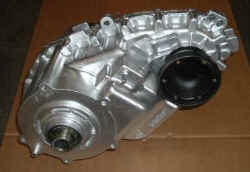 Transfer cases drive the front output shaft with either a geartrain or a flat Hyvo-type chain. Transfer cases designed for four-wheel-drive vehicles offer a low-range drive mode, where all-wheel-drive vehicles typically have a single-speed transfer case. 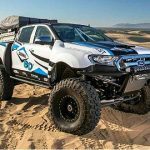 A full time 4WD system provides engine power to both the front and rear axles on all surfaces at all times. This usually requires a transfer case with a center differential, a viscous coupling, or both. Full-time 4WD improves traction and handling on paved surfaces in inclement weather, but may reduce fuel economy. 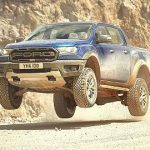 Current model vehicles that offer full-time four-wheel drive: Range Rover, Land Rover Defender, Toyota Land Cruiser, Jeep Grand Cherokee, Mitsubishi Montero, Land Rover Discovery, Ford Explorer. An ingenious device that can act as a limited-slip differential. A viscous coupling is a small sealed drum filled with a measured quantity of silicon fluid. Inside the drum are two sets of interleaved plates. One set of plates is splined to the outer drum and one set is splined to the inner shaft. In a typical application, a viscous coupling is installed in a transfer-case center differential to act as a limited-slip. The outer drum is attached to the front output shaft, for example, and the inner shaft is attached to the rear output shaft. As long as both front and rear output shafts turn at the same speed, both sets of plates in the viscous coupling turn at the same speed and there is no relative motion between the plates. If the front shaft were to begin turning faster than the rear output shaft, indicating front wheel slip, the two sets of plates would develop relative motion and begin slicing through the silicon fluid. The silicon fluid would heat up and solidify, momentarily locking the sets of plates together and counteracting an open differential’s tendency to transfer only limited amounts of power. With the plates locked together, relative motion stops; the silicon fluid cools down and returns to its liquid state, freeing the plates. Currently the least expensive and most common 4WD system. A part-time 4WD system is designed to be operated only on reduced-traction surfaces. 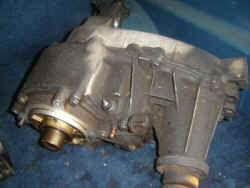 The transfer case lacks any mechanism to allow front-to-rear axle speed differentiation. Thus, any accumulated driveline bind must be released via tire scrub. Extended use of part-time 4WD on a high-traction surface, such as dry pavement, can adversely affect handling and damage the driveline. All-Wheel Drive (AWD): An all-wheel-drive (AWD) vehicle has a driveline with the capability to send power to all four wheels, usually on a full-time basis. 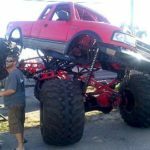 Most AWD vehicles are designed for all-season, instead of all-terrain, operation: ground clearance is usually closer to that of a car than a 4×4 truck, and the single-speed transfer case lacks a low-range. All-wheel-drive trucks currently on the market include the Oldsmobile Bravada, Toyota RAV-4 and Mercury Mountaineer. The transfer case drive mode that provides maximum gear reduction to the wheels and multiplies engine power. Low-range is for slow-speed operation. Where the case’s high-range ratio may be 1.00:1, low range ratios are typically between 2.20:1 and 3.50:1. 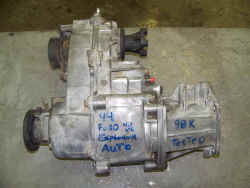 A transfer case drive mode, like Neutral or low-range. 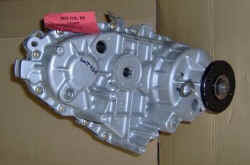 Most conventional part-time transfer cases offer a 2-Hi as well as a 4-Hi mode. High-range is for normal-speed operation. In most instances, high-range is a straight 1.00:1 ratio, offering neither a gear reduction (underdrive) nor an overdrive. Some full-time systems are not a straight 1.00:1. The Range Rover’s high-range is actually a 1.206:1 underdrive. 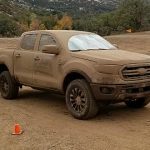 A vehicle with a four-wheel drive system designed to shift between two- and four-wheel drive while moving is said to have a shift-on-the-fly system. Current part-time shift-on-the-fly 4WD systems include GM’s Insta-Trac, Jeep’s Command-Trac, and Toyota’s 4WDemand. In shift-on-the-fly four-wheel-drive applications, a synchro is a mechanism that synchronizes the speed of the to-be-engaged front output shaft to the speed of the rear output shaft, spinning the front driveshaft up to road speed before the front drive axle is engaged. Every part-time shift-on-the-fly four-wheel drive system needs some type of synchro. 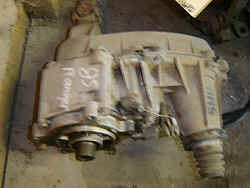 Many use a synchro in the transfer case identical to the synchro found in manual transmissions. 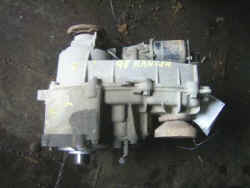 Others use a magnetic clutch similar to that used on an air conditioning compressor. Automatic-locking hubs automatically engage, or “lock,” the hub and tire and wheel assembly to the front drive axle’s axle shaft when the operator engages a four-wheel drive mode. When released, or “unlocked,” the axle shaft is disengaged from the hub body assembly and the wheel can rotate freely on the spindle. To unlock most automatic-locking hubs, the operator must select a two-wheel drive mode and drive the vehicle straight backwards at least 10 feet. The hubs of any part-time four-wheel drive system should always be unlocked before driving on dry, hard-surfaced roads. Manual-locking hubs perform the same function as automatic-locking hubs. However, the hubs must be manually locked or unlocked, usually by twisting a part of the hub from a “free” position to a “locked” position. Advantages of manual hubs include greater flexibility of operation, durability, and they provide the option of flat towing of the vehicle without a trailer. BW4404 All-Wheel Drive Chain Drive ? BW4405 ? Chain Drive ? The 1350 and 1354 are both 3-piece aluminum part time transfer cases. 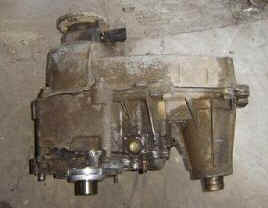 They both transfer power from the transmission to the rear axle and when actuated, also the front drive axle. The unit is lubricated by a positive displacement oil pump that channels oil flow through drilled holes in the rear output shaft. The pump turns with the rear output shaft and allows towing of the vehicle at maximum legal road speeds for extended distances without disconnecting the front and or rear driveshaft. The 1350 has a splined front receiver where the front driveshaft slides in. The 1354 has a yoke on the front that accepts a u-joint and holds it in place with straps. The 1350 and 1354 are produced as a mechanical shift and electronic shift. My driveshaft wouldn’t bolt to the new 8.8’s flange, so I decided to have a new one built. I could have found a flange for the 8.8 that would accept the 2.5-inch u-joint in order to retain my original shaft, but I wanted to beef things up a bit. 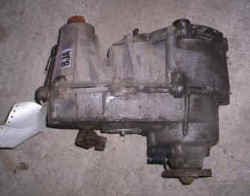 I got rid of the yoke on the transfer case and replaced it with a flat flange from a 1986 BroncoII BW1350 transfer case. I now have a flat flange on the axle and on the transfer case with a 1310 u-joint at each end secured in flat flanges. The driveshaft then bolts in flange to flange. These flat flanges allow the bigger u-joints and eliminate the weak u-joint straps at the transfer case. The 1359 is a 3-piece aluminum case. 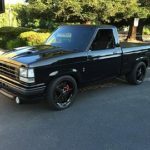 It consists of a front mounting adapter, a front case and a rear cover that transmits power from the transmission to the rear axle. The input shaft and the output shaft are connected together by a coupling sleeve providing direct drive between the 2 shafts. The case assembly contains no lubricant and none should be installed. Works like a BW1354 but also houses a transfer case clutch. This clutch , which is controlled by the generic control module (GCM), enables the vehicle to be driven in 4wd on dry pavement. It also has a dealer installed Neutral (N) position mode. The Dana 20 used in Bronco’s had a low range ration of 2.46. The Dana 20 used in Jeeps, Scouts, and Blazers had a low range ratio of 2.03 and there cases aren’t interchangeable. For purposes here, the Scout, Blazer, and Jeep versions have been called Spicer 20’s. The C-4/Dana 20 is a popular swap in Ford Rangers. This swap will require modification to the drive shaft lengths. Wild Horses (209-943-0991) offers the Cold Duck Dual Dana 20 transfer case for a low gear ratio of 6.05:1. 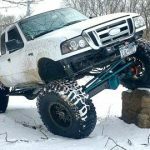 Advance Adapters offers an Atlas II (3.8:1 Ultra low) and (4.3:1 Extreme low) gear-driven transfer case is the ultimate gearing solution for combining both on and off-road performance. 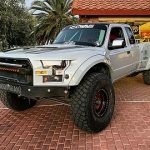 With an Atlas equipped 4WD, you have the opportunity to select a sensible ring and pinion gear ratio for great street performance and strength. Combined with a low-geared crawl ratio of your choice, you now have the ultimate combination. This allows you to compete with the most well equipped off-road vehicles and cruise comfortably down the paved roads. Exploded Views: Click HERE for a PDF file with exploded views and part numbers of various transmissions and transfer cases.